How did you make the switch from design to product development? I'd known for a long time that one day I'd like to launch a product. Like many freelancers, I was fascinated by the idea of a passive income as opposed to trading my time and skills for money. So I started building a list teaching developers how to design. I didn't have a product (or the time to make one) but I knew when the time came to launch something, I'd thank myself for getting a head start on audience building. The funny thing is, I spent years thinking about what products I could build and launch. But I already had a product, I was just too close to it to realise it was something I could sell. I had built a small tool, Client Portal, that I used with my freelancing clients to help keep track of their projects and deliverables. It was born out of a frustration for complex project management tools like Basecamp that my clients never used, and me wanting something small and lightweight I could use with my clients. 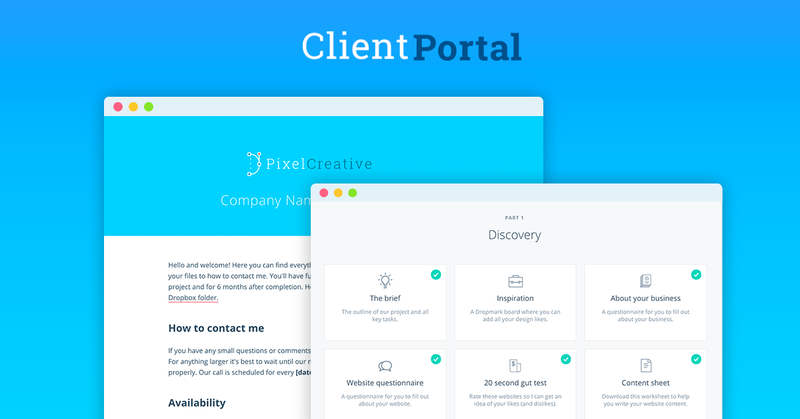 Client Portal is a super simple way to keep your clients deliverables in one place. At the start of a project, you give them a login to your website and they can see the status of their project with all the links and files neatly organised for them to access whenever they want. Looking back, it seems obvious that my first product should be something I had already made. It just took other people telling me "Laura, why aren't you selling this to other freelancers?" for me to make the connection. What have you learned from Client Portal's launch? I actually had a very successful initial launch despite having a half-baked product. At the time, Client Portal wasn't really usable. You had to go into a text editor and manually edit the code to create a new portal. I didn't want to plug a lot of money into the product until I was sure people would buy, so I had to put together a very compelling offer as to why someone would pay for a product before it's fully developed. Firstly, I gave them a huge discount. Client Portal was going to retail for $199 but I gave it away for $99 with lifetime updates. That meant if you bought it then now, you'd get the WordPress version in a couple of months and save 50%. I also only offered this discount for three days. I deliberately closed sales after a short period of time so I could go and develop the product. This created urgency but also showed that I was serious about it being developed properly. The first launch generated just under $9,000 which was more than enough to show me that I had created something people actually wanted, and gave me the revenue to hire a really good developer (who I still work with today) to make it into something usable. What are the biggest challenges of working on a side product and how do you overcome them? There are two main challenges of working on a side product: crippling doubt and limited time. If you've never launched a product before, it can be difficult to get your head around the fact that people will buy something you made. And they won't all ask for an immediate refund. I thought Client Portal was too simple. I assumed people wanted project management tools with bells and whistles and when they realised this wasn't Basecamp, they'd want their money back. That turned out to be a completely false assumption. There were many people just like me who worked on small scale projects and wanted something to make them look like the Real Deal without all the extras. This imposter syndrome is something I still struggle with now. I still worry that people won't like the product but I try not to let it hold me back. I keep a Trello board full of positive comments and testimonials and a spreadsheet full of feedback. Seeing how much the positive comments outweigh the negative is hugely motivating. The second challenge is limited time. When you're working on a product while freelancing full-time, it can be really difficult to make progress. What I've learned is that it's mostly not about time at all, it's about priorities and urgency. Client work was providing all of my income so that was my priority. Client Portal was something that I could do at any time. Maybe I'd wait a month until things quietened down. Maybe that month would turn into a year or more. But I ended up getting an opportunity. If I could build and launch Client Portal in one week, I'd be able to promote it to a list far bigger (and more relevant) than mine. It comes as no surprise that I ended up finding the time to build Client Portal alongside my client work. And I try to remember this every time I want to launch something but use the excuse of 'not having time'. What does the homepage of a product need to be like for it to pique your interest? It should get to the point quickly. The longer it takes for someone to understand what the product is and who it's for, the less likely they are to convert. Having said that, it should also provoke some kind of emotional response. What kind of pain led them to wanting to a find a solution for the problem they're having? The best landing pages are ones that customers read thinking "this describes me perfectly, it's like the product was made exactly for me". It might take a few tries (and a lot of customer research) to get to that stage but it's important to keep iterating until you have something that works. Design is also important, though not as important as speaking to someone's pain. My initial landing page for Client Portal was ridiculously ugly and I later found out that it stopped people from buying because they weren't sure it was a genuine product! How can making a product make you a better designer? I was surprised that making a product made me more valuable as a designer. Suddenly, I was able to advise clients not only on the design aspect of the project, but I could use my insights from Client Portal to help with the strategy too. The most valuable freelancers are the ones who have the most business experience. The ones who can use their knowledge to help clients make more money (by increasing opt-ins, trials, demos, purchases). I can now use my knowledge of Client Portal to influence design decisions I make on my clients' websites. You also teach developers design. How can pattern libraries help bring designers and developers closer together? As the web becomes bigger and more complex, the need for designers and developers to work closely together is more important. It's becoming increasingly difficult to be an effective designer and developer at the same time. There's too much to learn. Whereas I do think there needs to be a separation in disciplines, I also think we need at least a basic understanding of what each one does. That why I teach developers just enough design to help them implement new features without always needing a designer, or just being able to work more effectively with designers and understand their language. The same goes for designers too. They don't need to become a developer, but they do need to have a working knowledge of development to enable them to produce the most effective designs. That's what I like about pattern libraries. It creates a mindset shift for designers and developers to be able to think about websites in terms of systems, as opposed to static pages. A designer can work on components in isolation and have a better understanding of where it fits as a whole. They can take into consideration reusability and interactions rather than making something bespoke for every new feature. Pattern libraries also help developers quickly put together prototypes based on already tested components. When they need something new they can then work with a designer to help them add to their pattern library. How do you onboard your clients? I'm a real sucker for what I like to call manual automation when I onboard my clients. This means I like to systemise my processes as much as possible, yet manually pull the trigger and add any thoughtful details along the way. This saves me a whole bunch of time and makes me looks ridiculously professional (even if I don't always feel it). Once the proposal is accepted, I'll use HelloSign to send over a standard contract and Harvest to send over a 50% deposit. While that's being taken care of, I set up some 'homework' for my clients. These usually consist of things like worksheets, questionnaires and checklists depending on the project. I usually have a bit of a wait time before I can get started on a project so this gives the client something to do that's beneficial while I finish off whatever client work I have on at the time. Taking the time at the start to onboard a client correctly makes a huge difference. Not only does it make the entire project easier to coordinate, but it lets my clients know that they're in good hands and they're working with a professional. What can people expect to take away from your talk at Pixel Pioneers Belfast? My goal is to give attendees a roadmap of how they can go from where they are now, whether it's freelancing or working for a company, to launching their first product on the side. I'll go through what I learned from launching Client Portal — both the good and bad — and use that to put together a clear guide on how you can start making some income from a digital product. Pixel Pioneers Belfast on 16 November features 8 talks, followed by a day of workshops with Harry Roberts (Building Faster Websites) and Eva-Lotta Lamm (Sketching Interfaces). Ticket bundles, group and student discounts are available.